There is a new front page article on the issue we have been working on with residents help, including the Petition you all signed on March 23. The Press got the facts right. When our own town does wrong to residents of Dewey on transparency and accountability, let’s have gratitude, and thank heavens for the Press who protect our personal freedoms and rights as citizens of the United States. A Dewey Beach resident has been charged with theft and disorderly conduct after he left a town audit committee meeting with a draft financial audit report. Two journalists who attended the meeting also took the report when they left the meeting. Jeffrey Smith of Dewey Citizens for Accountability arrived at the Aug. 3 meeting minutes before it adjourned. Smith said following the meeting, he left with a copy of TGM’s draft financial report, which was discussed at length during the meeting. Audit committee Chairman Larry Silver approached him after the meeting and insisted he give it back, Smith said. Smith said a warrant for his arrest for theft and disorderly conduct has been issued, charges he called baseless. Smith said he is scheduled for arrest and processing at the Dewey Beach Police Department Friday, Aug. 10. Smith said others had already left with their copies of the same draft report, which had been presented at the public meeting. “The grab of the document by Mr. Silver was physical, and I left without any contact in return other than to insist he back off and out of my way as I entered my Jeep to leave,” Smith said. Smith said he returned his copy of the draft document by courier Aug. 8. 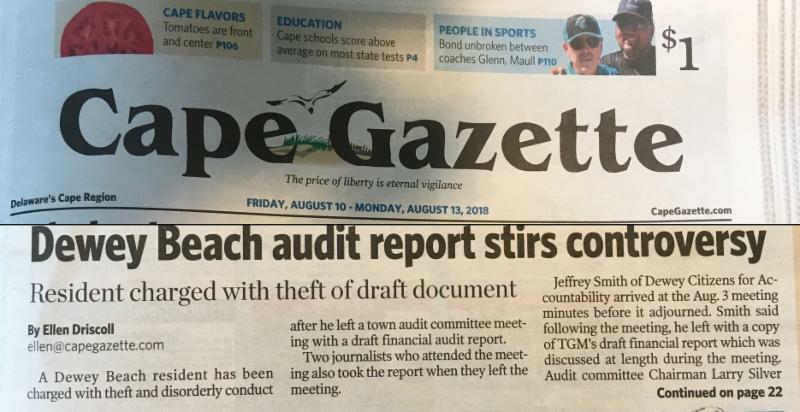 The Cape Gazette received a copy of the draft financial report at the meeting. Silver requested that it be returned Aug. 6. The Cape Gazette returned the draft as a courtesy but retained a copy of the document. Dewey Beach Police Sgt. Cliff Dempsey confirmed Smith has been charged with theft and disorderly conduct against a town official, and said Smith's attorney stated his client would turn himself in. Silver declined to comment on the matter. Smith also said the audit did not include an accounting of four separate bank accounts held by the police department; TGM Group partner Roy Geiser and Silver said the audit had obtained records and financial statements for all four accounts. Smith also said the report did not include an inventory of all equipment obtained through a military surplus equipment program, a federal program Dewey Beach has participated in for several years. Smith said one-third of the vehicles obtained through the program were considered controlled and unable to be sold, but the remaining two-thirds could be. “Were they sold or given to friends? We don’t know,” he said. The town has a $5,000 capitalization threshold policy, Koenig said. A draft of a financial report for Dewey Beach presented at an audit committee meeting Aug. 3 has resulted in the sudden resignations of two committee members and an arrest warrant against a resident who came to the meeting. The auditor, TGM Group, presented the draft report of the second phase of agreed-upon procedures that investigated town bank accounts and police and beach patrol handling of funds. Geiser also said internal financial controls are insufficient. He said he would work with town accounting firm Luff & Associates to develop policies, procedures and internal bookkeeping controls for the town. Audit Committee member Diane Tenhoopen said TGM Group’s report included four significant findings, two of which repeated earlier findings. The Cape Gazette reported in October 2017 that during an investigation into allegations against former Town Manager Marc Appelbaum, an unidentified officer described proceeds from sales of military surplus equipment obtained through a federal program as a slush fund used to pay bills for equipping police cars. TGM’s report examined the beach patrol’s off-balance-sheet account, which found account deposits are mostly donations from individuals and businesses, and withdrawals are used for costs involved in the annual national beach patrol competition. Tenhoopen said Dewey Beach Patrol Captain Todd Fritchman gave TGM Group a false federal employer identification number for the fundraising efforts. “As CPAs, both TGM and Larry Silver have access to the IRS site, and they couldn’t find the number, and Todd had no documents to substantiate it,” she said. Silver said a previous TGM review found no 501c3 account through the IRS. Audit committee member Dennis Trencher said he and others were lied to about the account’s nonprofit status. Tenhoopen said that since the police and beach patrol kept off-the-books accounts and dealt primarily in cash, there was no way to know how much money is missing, where it went and what it was used for. She said she recognizes the town does not have the resources or funds to undertake a forensic audit, but she questioned why the employees involved remain at their jobs. “If this happened anywhere else, employees would have been terminated already,” she said. “The town is not taking the steps it needs to take. Trencher resigned after the meeting. “We could have all the procedures in the world, but the issue is trust, and I’ll leave it at that,” Trencher said. Dewey Town Manager Scott Koenig said he and commissioners cannot publicly discuss any personnel issues. A draft financial report of the town’s 2018 fiscal year financials was also reviewed at the meeting. Dewey commissioners will give an update on the agreed-upon procedures work and will discuss and possibly vote to accept the 2018 fiscal year audited financial statements at the monthly town council meeting Aug. 10. Redefer said when both draft reports are finalized, they will be posted on the town’s website, which he expected to occur within the next few days. Insufficient segregation of duties (repeat finding). The system in place creates conflicts because duties are assigned to a single individual, producing a high level of internal control risk. Timely and accurate financial reporting. The town’s financial reports were not timely or accurate throughout the year. Account reconciliations (repeat finding). The audit found a lack of properly designed accounting practices and that the town does not prepare periodic reconciliations for many of its assets, liabilities, revenues and expense accounts throughout the year. Internal control environment. The town’s internal controls, particularly the reporting lines, are not properly implemented.